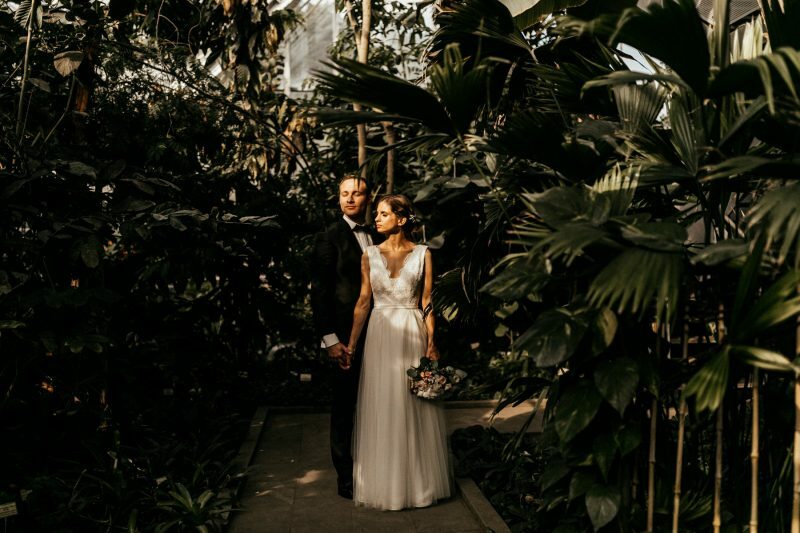 Hey, how about a wedding in a botanical garden? Definitely my thing! Couples often ask me about suggestions for a perfect location to take wedding portraits. If you ask me, wedding portraits time is one of the most important parts of your wedding day if you’re willing to spend it right – showing love, true emotions and sharing the joy with your beloved husband/wife. For all my couples, I always think it trough and ask them many questions to get a clearer image of what they like, what their style is and what suits their personalities. It’s important because of light conditions: you don’t want to spend a lot of time at 12:00 in a city, when the light is harsh and too strong for beautiful portraits, as well as you don’t want to miss the amazing sunset light and spend your time in the shadow. Google is your friend, be prepared, take a look around beforehand, you could discover many great locations with a simple stroll around. If you’re a more urban type, choose the city streets or endless rooftops and if you’re more romantic, nature type, even a simple field might work the best for you. Hope you like posts like this one! I promise, I will try to post more tips from now on! If you have any questions drop me a message, I’d love to answer! Ps. Don’t forget to check some of the most amazing moments from last July’s wedding in Ljubljana city centre.